Head Coach Anthony Lynn and Chargers' Play-By-Play radio announcer Matt "Money" Smith participate in Conversation with Coach at Dignity Health Sports Park on Thursday, April 11, 2019 in Carson, CA. Curated gameday menu from Conversation with Coach at Dignity Health Sports Park on Thursday, April 11, 2019 in Carson, CA. A Premium Experience Member takes a virtual look at the L.A. Stadium at Hollywood Park during Conversation with Coach at Dignity Health Sports Park on Thursday, April 11, 2019 in Carson, CA. The Thunderbolt Drumline gets the crowd pumped at Conversation with Coach at Dignity Health Sports Park on Thursday, April 11, 2019 in Carson, CA. 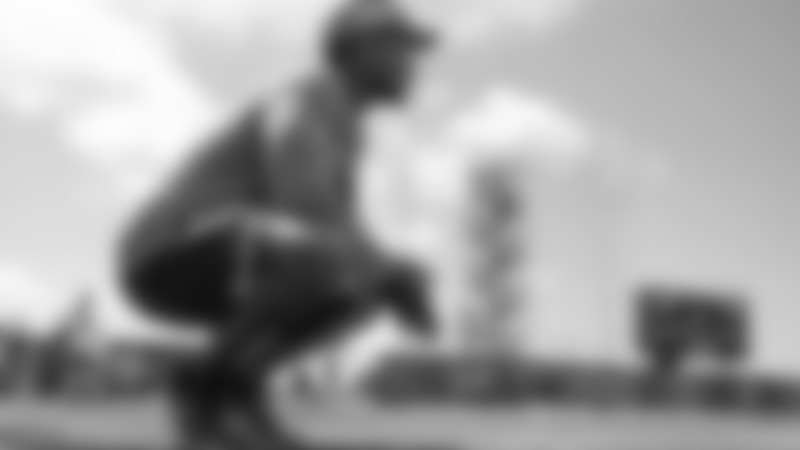 Premium Experience Members stop by Suite MC6 to get customized hats at Conversation with Coach at Dignity Health Sports Park on Thursday, April 11, 2019 in Carson, CA. A few Premium Experience Members enjoying a beverage in the End Zone Field Club at Conversation with Coach at Dignity Health Sports Park on Thursday, April 11, 2019 in Carson, CA. A few Premium Experience Members at Conversation with Coach at Dignity Health Sports Park on Thursday, April 11, 2019 in Carson, CA. A Premium Experience Member takes a virtual tour of the L.A. Stadium at Hollywood Park at Conversation with Coach at Dignity Health Sports Park on Thursday, April 11, 2019 in Carson, CA. A member of the Charger Girls visits with attendees at Conversation with Coach at Dignity Health Sports Park on Thursday, April 11, 2019 in Carson, CA. Coach Lynn and a Premium Experience Member during Conversation with Coach at Dignity Health Sports Park on Thursday, April 11, 2019 in Carson, CA. 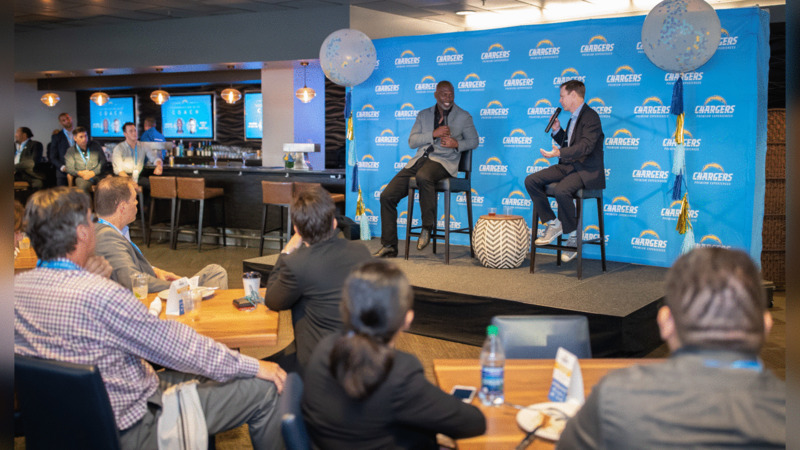 Coach Lynn and Smith participate in Conversation with Coach in the Stadium Club at Dignity Health Sports Park on Thursday, April 11, 2019 in Carson, CA. Stadium Club table owner, Jeff Lipton, asks Coach Lynn a question during Conversation with Coach at Dignity Health Sports Park on Thursday, April 11, 2019 in Carson, CA. Coach Lynn takes the stage at Conversation with Coach at Dignity Health Sports Park on Thursday, April 11, 2019 in Carson, CA. Coach Lynn meets with Premium Experience Members after the Q&A in the Stadium Club at Conversation with Coach at Dignity Health Sports Park on Thursday, April 11, 2019 in Carson, CA. Coach Lynn shakes a Premium Experience Member's hand during Conversation with Coach at Dignity Health Sports Park on Thursday, April 11, 2019 in Carson, CA. Coach Lynn with some of the youngest attendees at Conversation with Coach at Dignity Health Sports Park on Thursday, April 11, 2019 in Carson, CA. Curated gameday menu in the Stadium Club at Conversation with Coach at Dignity Health Sports Park on Thursday, April 11, 2019 in Carson, CA. A view of the field from suite MC6 from Conversation with Coach at Dignity Health Sports Park on Thursday, April 11, 2019 in Carson, CA. A few Premium Experience Members in the stands at Conversation with Coach at Dignity Health Sports Park on Thursday, April 11, 2019 in Carson, CA. Smith proposes a toast during Conversation with Coach at Dignity Health Sports Park on Thursday, April 11, 2019 in Carson, CA. Coach Lynn and Smith converse during Conversation with Coach at Dignity Health Sports Park on Thursday, April 11, 2019 in Carson, CA. Coach Lynn posing with some Premium Experience Members during Conversation with Coach at Dignity Health Sports Park on Thursday, April 11, 2019 in Carson, CA. Coach Lynn takes a photo with some Premium Experience Members during Conversation with Coach at Dignity Health Sports Park on Thursday, April 11, 2019 in Carson, CA.